Gonzalo Higuain scored his first goal for Chelsea in their clash with Huddersfield on Saturday, but some fans couldn’t help but have a dig at a former player. As noted by BBC Sport, Alvaro Morata joined Atletico Madrid on a loan deal until the end of next season ahead of the January transfer window deadline, opening the path for Higuain to become coach Maurizio Sarri’s first option up top. Although there is still a chance he returns to Stamford Bridge at the end of the loan spell, it ends a turbulent stint with the Blues in which the Spaniard managed just 24 goals in 72 appearances. That lack of clinical edge in the final third undoubtedly hurt Chelsea, as they have slipped out of the top four prior to this weekend, having scored just 40 goals in their opening 24 Premier League games. That gives them the lowest goalscoring tally of the top six sides in the standings. With Morata unable to offer a consistent source of goals up front, the decision was taken last month to reshuffle the pack, and Higuain has wasted little time in suggesting that he can be the prolific scorer that Chelsea need this season to achieve their objectives under Sarri. While the majority of the attention was on the movement and finish from the Argentine, the fans below couldn’t help themselves and had a dig at Morata as the Spaniard was trolled for likely missing the opportunity if he had been on the end of N’Golo Kante’s brilliant assist. 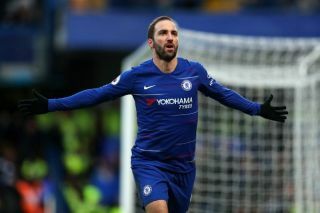 It seems as though many are relieved that he has moved on and now Higuain is set to lead the line, but the 31-year-old must also now prove that he can score regularly to keep Chelsea competing at the level at which they wish to be at moving forward. No way Morata would’ve finished that. Go Blues! Gonzalo Higuaín has now scored more Premier League goals (1) since the 11th of November than Alvaro Morata. Fantastic goal from Higuain! Something we would never see from Morata. Higuain not gone down once. Not moaned and whined once. Won physical battles. Finished chances. Looked confident. Literally everything Morata doesn’t do.